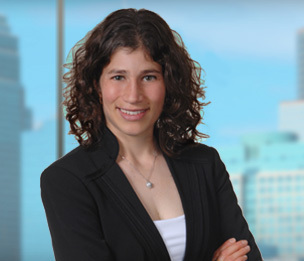 Tania Shapiro-Barr is a member of the Intellectual Property Group in Dykema's Minneapolis office. Her practice focuses on the preparation and prosecution of patent applications in technology fields including medical devices, biotechnology, and pharmaceuticals. Ms. Shapiro-Barr has experience prosecuting both foreign and domestic patent applications, as well as counseling clients and drafting opinions regarding patentability, freedom-to-operate, infringement, and validity. Her experience further includes patent litigation and trademark prosecution. Prior to attending law school, Ms. Shapiro-Barr received her M.D. from the University of Wisconsin Medical School. Following medical school, she held a Legal Internship with the General Counsel of Children's Hospitals and Clinics of Minnesota. Ms. Shapiro-Barr’s past experiences include serving as White House Intern in the office of the former First Lady, Hillary Rodham Clinton.